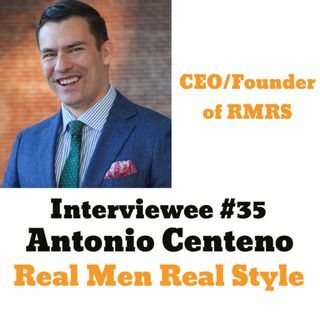 Interviewee #35 - Antonio Centeno of Real Men Real Style! As I was preparing my morning routine, it dawned on me that I hadn't message Antonio back from last year. Having come to Thailand, Antonio was in the resort city of Hua Hin, sucking in the sunshine and enjoying family time. He was, however, arranging a meetup in Bangkok, Thailand. Myself, teaching just outside Bangkok (at the time), emailed him and was excited to finally meet him. Unfortunately the plans fell through and that was the end of that (back in 2017). A thought came across ... See More my mind and I emailed him about bringing him on my podcast. After sending a few emails to his assistant, we agreed on a time to bring him on and now yes, the founder of www.realmenrealstyle.com and the unbelievably popular Youtube channel -- is here. Antonio has studied clothing design in London, Hong Kong, and Bangkok. He is a former US Marine with an MBA from UT Austin and a BA from Cornell College. He loves to hear from old friends and make new ones.